The presence of mold in your home can lead to a range of potential problems. Mold can damage your properties materials as well as create a number of quite serious health issues in your home. Mold can be dangerous with direct physical exposure as well as with mold particle inhalation. There are a variety of mold types, which can become airborne and increasingly dangerous with improper removal attempts. Consider professional mold removal services to handle all your residential mold removal needs. 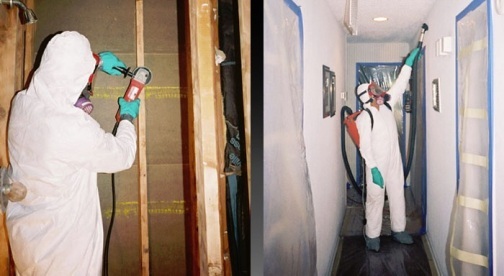 Professionals have what it takes to efficiently, safely and completely remove your entire unwanted residential mold presence. With the presence of mold in your home can lead to major health issues through new illness formation and through the worsening of an existing illness. * Mold can affect individuals through direct exposure, causing skin irritation and rashes to form. Mold related skin irritation can be reduced and fade naturally or with the help of a topical medication if needed. * Mold particle inhalation can also lead to a range of issues. Mold can create nasal stiffness, coughing, throat irritation and eye irritation when the particles are disturbed and become airborne. For people who do not have compromised respiratory systems or do not have mold-related allergies, these symptoms can mirror that of a common cold or allergy flair up. Even without serious immediate effects, the presence of mold can have a major long-term effect on your health and the health of your loved ones. * Individuals with mold related allergies could heave serious reaction to mold particle inhalation. If you are aware of your mold-related allergies or if you mold-related symptoms are progressively getting worse, it is important to see a doctor immediately. * Individuals with respiratory illnesses such as asthma will see much larger health impacts from the presence of mold. Individuals with these pre-existing illnesses need to take special care to avoid mold areas such as compost piles, landfills, heavily wooded areas and freshly cut grass areas. Mold in your home can lead to major to very serious health impacts on yourself and on the lives of your family. Don't let your home be less safe than it can be. If there is any mold in your home, it should be removed completely and efficiently by a trained and trusted professional. * Low humidity levels can combat mold growth. Attempting to keep your indoor humidity below 50% can be very effective in minimizing the spread or creation of mold in your home. Humidity levels can change drastically throughout the day, so it may be worth monitoring a number if times throughout the day to ensure your home humidity level remains below or at 50%. Air conditioners and dehumidifiers can keep the humidity in your home lower. * Higher levels of home ventilation can make it harder for mold to be created in your home. Mold needs stagnant conditions to fester. Increasing the ventilation in your home can directly combat the presence of mold. * Roof leaks can lead to mold in your home. As water is able to flow thorough the leak and pool in an unventilated area of your home, mold can easily grow. Have your roof inspected and repaired to prevent further mold creation or growth. * If you experience a home flood or notice water damage in your home, act fast! Contact a professional immodestly to resort your water damage and prevent the growth of mold in your home. * Bathrooms can have the most moisture of any room in the home. This can make bathroom very susceptible to mold growth. Use bathroom cleaning products can that work to prevent mold when cleaning your bathroom area. * If you have custom furniture that cannot be completely restored after water damage has occurred, do not attempt to salvage the furniture. This lack of drying can lead to mold growth within the appliance. It is safer to simply replace the piece then risk the presence of harmful mold in your home.